My older boys have grown up listening to Adventures in Odyssey on Christian radio programs and have collected several of the audio CD's over the years. We have taken many a journey in the car, with Adventures in Odyssey entertaining us for hours on end. We as a family absolutely love it! A great way to grow and learn, and have your imagination engaged, unlike watching TV. You hear the story play out, but you get to use your own imagination on so many of the stories characters and surroundings! These devotions are a great addition to a family meal at the table. One of my favorite authors Tricia Goyer is a contributor to this great family bonding book. Dishing up a five course meal, each devotional takes about 15 minutes. As you finish up nourishing your body with physical food, switch into nourishing your spiritual man as well. The devotionals can be used in any order so mix and match if you feel led, or go straight through if you prefer. To help us stay organized we went straight through the book with a place to mark our spot, simply to not have to take time to choose which one we would do next. With 90 great devotions your family will be fed for a good three months! What a fantastic heritage to start with your children while they are young, and hopefully pass on great mealtimes to their own families. 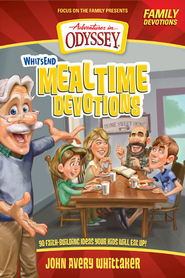 You can enter to win Whit's End Mealtime Devotions this week as we celebrate Children's Book Week! I actually would love to win this to use with my childrens' church group! My kids and their kids come for Sunday Dinner about one time a month and we always start our meals with a blessing, this is a good thing and all my kids and grandchildren will enjoy this. We usually do a family devotion before suppertime. Right now we are using a family bible and The Humble Heart book of virtues! My daughter, husband, and I talk about the Bible and God in our life. We pray before our dinner. We don't have a set devotional time but openly discuss. I am getting my children back into church...so devotions has not come yet but my friend said she does devotions in the morning before breakfast. Seems a good way to start the day with her kids. We have family prayer time but don't do devotions as much as we should. I'd love a book to help guide us!